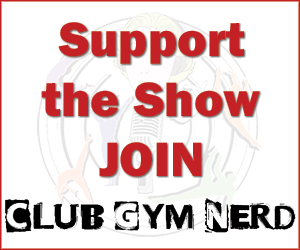 This week’s episode is brought to you by Club Gym Nerd members: Nicole Langevin of Precision Choreography, Rebecca W., Alison S. Allison B., Mary Anne M., and Suzanne M.
The media pressure on Kim Zmeskal and the heartbreaking life of Svetlana Boginkaya after the 1988 Olympics. The magic of the 1992 broadcast that included interviews with every controversial figure. Compulsories that took our breath away and should we still have them? Exhibit A: Vanda Hădărean (ROM) or Gruneneva (Unified Team). Eastern Bloc beauty. The judging crack epidemic of 1992. Exhibit B: Christina Bontas’s 9.9 beam routine. Kim Zmeskal fell on beam and the world didn’t actually end. The glory of North Korea, Kim Gwang Suk on bars. All praise the dear leader. The Karolyi double back set on beam, AKA freeze in mid-air before flip. Why Wendy felt embarrassed of her bronze medal for too long. The most common skills of the quad and the routines that were way ahead of their time, like Tatiana Lysenko (Unified). Luisa Portocarrera (CAN/GTM), beam goddess. Watch it here. Tatiana Lysenko’s double twisting yurchenko vs. the world; the 1992 vault final. The Beam Final: Li Lu – press handstand to HEALY to arch pose! Pour out some Yang Bo. Lysenko’s backspin, Shannon Miller. One of the greatest beam finals of all time. The Bars Final: The bars medalists got air on the bars that were super close together. Lu Li got mega air and Kim Gwang Suk – TKATCHEV TO COUNTER KIM! WHAT?! The Floor Final: Lavinia Milosovici’s Romanian tumbling greatness, Henrietta Onodi’s triple full, Gutsu’s split leg double layout, so much genius! Steve Nunno’s motivational poster quotes. Bela Karolyi or Donald Trump quotes quiz. The training schedule for the U.S. Team. Yes, two-a-day practices. Check out Wendy Bruce Martin’s company Get Psyched for mental catching or her blog that we love here. Claudia Miller (Shannon Miller’s mom), wrote a book called, “My Child My Hero.” A gym nerd must-read. She\’s still at the forefront of fashion too I see. Great find! I am going to listen to this tomorrow. Can’ t wait. I am in nostalgic gymnerd heaven. The 1992 olympics were my catapult into gymnerddom. Can you please post a picture of those \’92 Australian leotards? It’s seen pretty well around 1:10, at least given the quality of the older footage. The Portocarrera beam routine was awesome. It\’s a shame the commentators didn\’t even notice while they were broing it up. I am so flipping excited to listen to this! Thank you so much for the episode! The lack of anything even close to resembling 180 on those splits causes me pain! Re DTY in 1992: the soviets had been chucking these since the mid 80s. Shushunova had a beautiful one (YouTube has 1988 olympics podium training) that she rarely bothered competing. Supposedly, at least 3 soviets did them at some point during 1987 worlds! My YouTube research also found a gorgeous one done by Golea of Romania at 87 worlds. Granted, that was at a time when most of the yurchenko vaults done by anyone but the soviets were utterly terrifying, and the soviets routinely did insane difficulty for no reason (google Tuzhikova FX ❤️!). To me, the difference in 92 was that everyone else had clearly mastered the FTY and it had become about as exciting as NCAA vault of recent memory. Still, the open ended COP was still a ways away. The Amanar was still mostly pointless in 2000! Sigh. This made me so nostalgic. I was a diehard fan in those days, traveling to Worlds and international meets. I got to see em all live…Milosivici, Miller, Lisenko, Yang Bo etc etc. But you guys really did Kim Zmeskal a disservice in discussing Shannon Miller \”winning\” the trials. Technically she didn\’t and it was a big deal at the time. Kim had the highest (she won obviously) scores at US Nationals in 92 AND she had the highest scores at the trials event…BUT because Shannon was injured at US Nationals and only used her trial scores as 100% of her total she came in above Kim who had a combined total from Nationals and trials (40% and 60%). Scores at trials were inflated compared to Nationals so Kim got shafted. Bela tried to explain this to the media at the time but Nunno took it as a \”win\” and ran with it as a way of promoting his athlete as the best American…albeit based on a false technicality. I had really hoped you guys would have discussed that. Please investigate (if you don\’t believe me) and do a correction. Nunno\’s nonsense still bothers me…even 24 years later! This article mentions the kerfuffle over who scored highest and how Shannon technically came out ahead only because she didn\’t compete at Nationals. Had Zmeskal not competed at Nationals (even though she was the winner) and counted 100% of her trials scores like Shannon, she would have officially won trials instead. It was highly unfair to Kim…but given what happened weeks later to Kim Kelly it seems to have been forgotten about. Oh I\’m laughing because you probably think I\’m a fan of US gymnastics. I\’m not. I\’m not even American. I just hated hearing you guys gloss over the event without giving Zmeskal her dues. I\’m approximately ten thousand years too late BUT, in rhythmic gymnastics they call clever little \”grace note\” or \”curliques\” done with the apparatus a mastery (and in fact these are required in the CoP) so maybe that could be borrowed and applied to fancy little embellishments that artistic gymnasts put on their moves? 5. All those nostalgic for the 10 should really watch the team competition all the way through and just see all the terrible scoring. It didn\’t differentiate properly, all the scores were bunched, compulsory deductions weren\’t taken just because the judges had painted themselves into a corner, having to give higher than the previous but too scared to give a ten. Henrietta Onodi did a great vault, handspring front half for a 9.950. Her second vault was higher, longer, had better form and a better landing and got 9.962. Made no sense. 6. Interesting skills: Ildiko Balogh from Hungary on beam did a round off layout immediate double back dismount!! I loved hearing Wendy Bruce. I was a fan at the time but even moreso after hearing her.